Crispy Coconut Cookies - Home. Made. Interest. 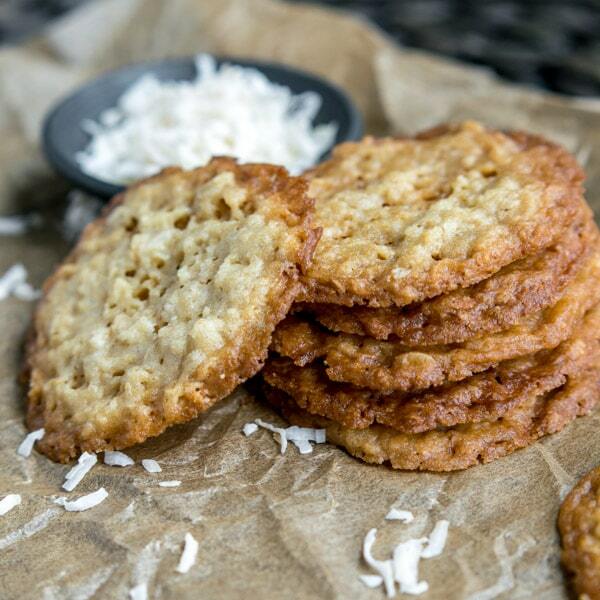 These Coconut Cookies are a classic cookie recipe made with rolled oats and coconut flakes. They are the perfect addition to your next cookie exchange! 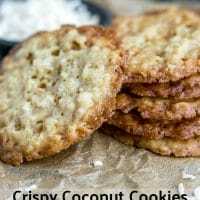 These Crispy Coconut Cookies are another awesome cookie recipe that I discovered as I was searching through my mother-in-law’s recipe box. 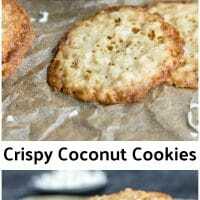 I love stumbling across classic cookie recipes like this and these Crispy Coconut Cookies are light, perfectly crispy, buttery, and slightly addictive! What is in Crispy Coconut Cookies? Butter – Almost as much butter as flour in fact. That’s what makes these cookies so thin and crispy. 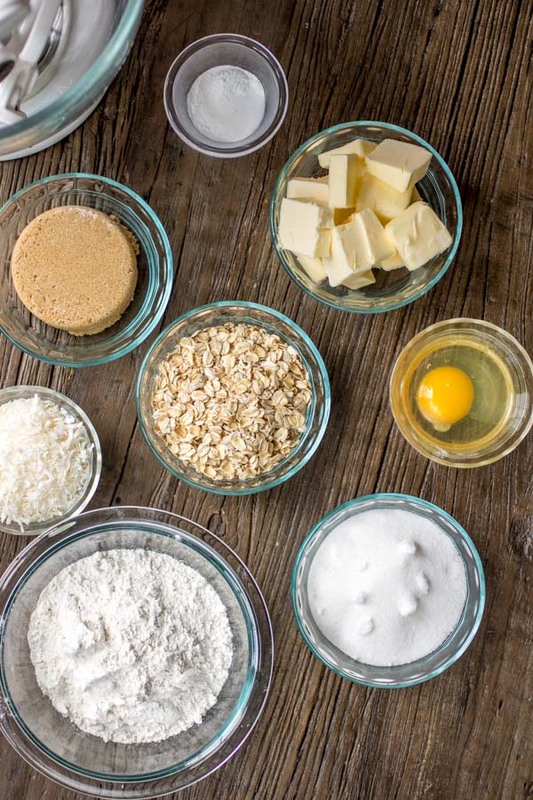 Sugar – A mix of white and brown sugar. The brown sugar adds just a little richer flavor to the cookies. Rolled Oats – These were a surprise to me! I wouldn’t have expected oats in a thin, crispy, cookie like this but they help give it just a little bit of chew in the middle. 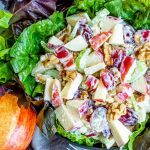 Coconut Flakes – Yum! You guys know I love coconut. My Coconut Cake uses fresh shredded coconut but these cookies use dried coconut flakes. 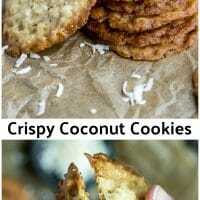 They add a nice pop of coconut flavor to the cookie without being overpowering. Salt – Don’t skip on the salt! Your butter should be unsalted and this little sprinkle of salt will help balance out the sweetness and bring out the flavor in your Crispy Coconut Cookies. In the bowl of your mixer cream together butter, sugar, and brown sugar until fluffy, about 2 minutes. 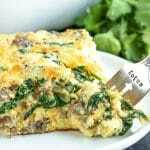 Add the egg and continue mixing until well combined. Slowly add the flour mixture to the butter mixture, mixing as you go, until well mixed. 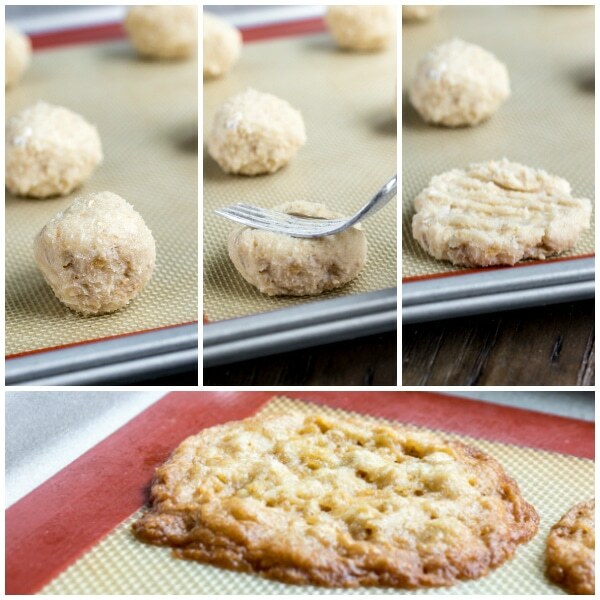 Shape dough into 1-inch balls and place them 2 inches apart on greased or lined cookie sheet. About 9 per sheet. They spread A LOT. Flatten the balls with a fork. Bake at 375 degrees F. for about 8 minutes or until light brown. Remove from the oven and allow the cookies to cool for 2 minutes on the cookie sheet. Then remove them from the cookie sheet and let them finish cooling on a cooling rack. Store in tight container until ready to eat. 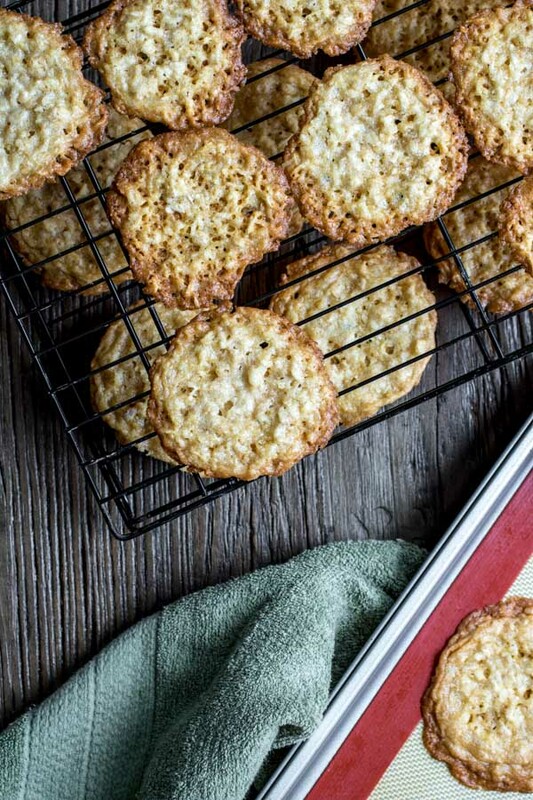 The extra butter and relatively small amount of flour in these cookies makes them spread as they bake so when they come out of the oven and cool completely they are perfectly crisp on the edges and, thanks to those rolled oats and coconut, slightly chewy towards the middle. I will admit when I first read the recipe I didn’t think they would be anything special but then I ate one…and another…and before I could do too much damage I had to pack them up and put them away. They are SO good!! Add these classic Crispy Coconut Cookies to your Christmas cookies baking list this year and put smiles on the faces of your friends and family! I got a large bag of dried macaroon coconut. It’s like a course flour but thinner than shredded. I like crispy cookies and wanted a nice crispy cookie recipe. I tried yours, although I added sea salt as soon as they came out of the oven to each cookie, I made no other change other than the coconut. They are more of a uniform to texture than what your appear to be (more like a lace) but are absolutely amazing. 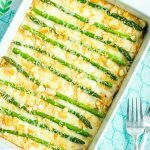 What a fantastic recipe! Perfect crisp. I’m actually not the biggest coconut fan and these are Some of the best crispy cookies!!! 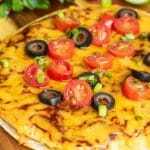 Easy to make. I rolled all the dough and put the rest in the freezer for another day. Thanks so much for sharing. These are so good! I rolled my dough balls in coconut then flattened with a glass bottom that was dipped in coconut. That’s the only change I made to the recipe. This one’s a keeper! Ooo I like the idea of rolling the balls in coconut!! I made these cookies and they are absolutely amazing! Terrific cookies! Now one of my favorites. Thanks! 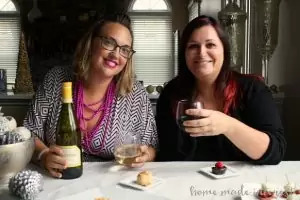 Your mother-in-law is a culinary genius! I would not dream oof changing a thing—why alter perfection. Man these are fantastic! 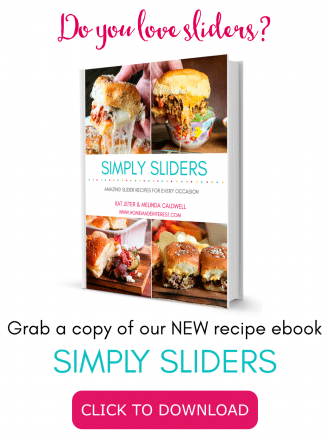 Great recipe, but WAY TOO MUCH sugar. 1/3 of the amount would be more than sufficient. Made it several times already and everyone loved it. So glad you and your family are enjoying the cookies! 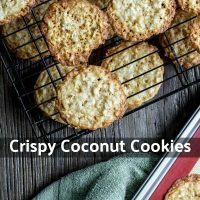 I am not a baker but had to try to make this because I really like crispy cookies and coconut. They are soo good! My husband liked them, too! One question though, are they supposed to be oily? I mean my hand is oily after handling one. Otherwise, they’re absolutely delicious! Thank you for sharing! They are a little oily since they are thin and crispy. Mine didn’t last longer than one day so I can’t tell you if they dry up a bit. Thank you for replying. I found that it’s not oily the next day. I was just too excited to eat right away. 🙂 Another question, can I add more coconut if I want more coconut taste? If so, will that mean I need to reduce the same amount in oats? Thank you again for these super delicious cookies!!!! Hey Sue, I would try coconut oil. Maybe try half butter and half coconut oil. That is a tricky question only because these are so thin, unlike a “normal cookie”. If you try it, let me know and I will add a note in the post.